Uber recently updated its app to collect user location data in the background. So, if you have updated your Uber app recently, your app’s location tracking permissions have changed, allowing the app to monitor your location before and five minutes after your trip ends, even if you have closed the app. 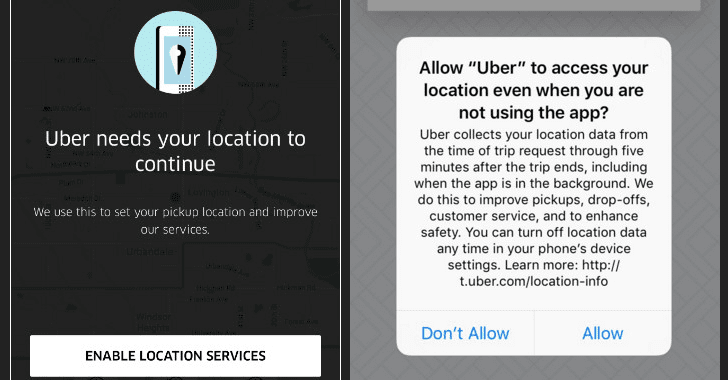 A popup on the Uber app will ask you, "Allow ‘Uber’ to access our location even when you are not using the app?" You can click "Allow" or "Don’t Allow" in response to this request. If you don’t allow it, Uber won’t track you. According to the company, this information helps not only drivers find riders without making phone calls, but also Uber monitor driver service, making sure riders are picked up and dropped off on the proper side of the street in order to enhance safety. "We’re always thinking about ways we can improve the rider experience from sharpening our ETA estimates to identifying the best pick up location on any given street. Location is at the heart of the Uber experience, and we’re asking riders to provide us with more information to achieve these goals." Location data during a trip is collected during the following time periods:When you’re interacting with Uber and the app is foregrounded and visible. When you are on a trip: from the time you request a trip until the trip is ended or canceled by the driver, even if the app is running in the background, but not visible to you. Up to 5 minutes after the driver ends a trip, even if the Uber app is close in the background. Uber announced the move last year which prompted a complaint [PDF] with the Federal Trade Commission. At te time, the Electronic Privacy Information Center said that "this collection of user’s information far exceeds what customers expect from the transportation service." It’s unexpected from a big company like Uber "to collect location information when customers are not actively using the app." However, "the FTC failed to act, and Uber is now tracking users non-stop." If you are worried, there’s a way to get around it. The company also explains how to turn this feature off. Here’s what to do to shut down this feature:For Android Users: Settings → Apps → Uber → scroll to "Permission" → toggle "Location." For users running Android Lollipop (5.1) and earlier: Settings → Location → toggle Off. For iOS Users: Settings → Privacy → Location Services → Uber → choose "Never." For more information on the feature, you can head on to the updated data collection agreement made by Uber.